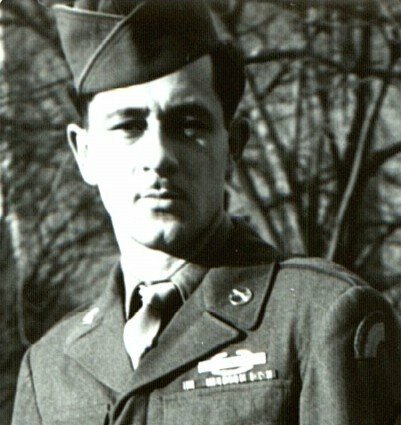 My father, John Petro, served in the European Theater of Operations during World War II where he was awarded the Bronze Star. He saw action in France, Germany, and Austria. He fought in the Battle of the Bulge and liberated the Dachau concentration camp. While my father rarely volunteered information about the war, when I asked, he would tell me. Here are some of his stories and pictures. His story of the liberation of Dachau was featured at HBO's original "Band of Brothers" website in 2001 to introduce Episode 9: "Why We Fight" and is told here in greater detail, along with the pictures he brought back. John Petro entered the Army with one kidney. Disease claimed the other when he was 15 and the Navy wouldn't admit him. The Army Air Force did not like his flat feet. In retrospect, his comment to me of the Army Air Corps was that they where the "sunglasses and Coca-Cola boys"... unlike the Infantry. He didn't mention either of his conditions to the Army and in 1943 he entered the service. A 9 to 12-month delay in shipment overseas, my brother recalls, involved more training State-side. 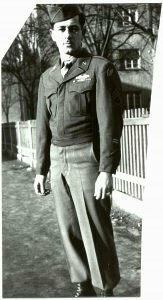 John went through boot camp three times in three different locations, eventually becoming part of the 42nd "Rainbow" Division, 232nd Infantry, Company E.
By the end of the war, the 42nd Division had established an enviable record. It was first in its corps to enter Germany, first to penetrate the Seigfried line and first into Munich. Rainbow soldiers had seized over 6,000 square miles of Nazi-held territory during their march across Europe. The Division ended the war serving as occupation forces in Austria and was inactivated in June 1946. "John N. Petro, 39 542 822, Sergeant, Infantry, Company E, 232d Infantry Regiment, [is awarded the First Oak Leaf Cluster to the Bronze Star Medal] for heroic achievement in action on 5 April 1945, at Wurzburg, Germany. When the Second Battalion encountered heavy machine gun, rifle, and bazooka fire while advancing into Wurzburg, Sergeant Petro led his squad in the direction of the heaviest enemy fire. Approaching a church tower from which the heaviest sniper fire was pouring, he led his squad into the tower, killing five of the enemy with his rifle. Encouraged by his aggressive and courageous action, the squad killed fifteen and wounded twenty of the enemy, thereby removing a serious pocket of resistance that had been holding up the battalion advance. 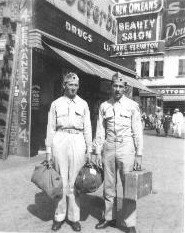 Entered military service from Burbank, California." American soldiers stand at the gates of the Dachau concentration camp after its liberation. Inmates were immediately given medical attention. 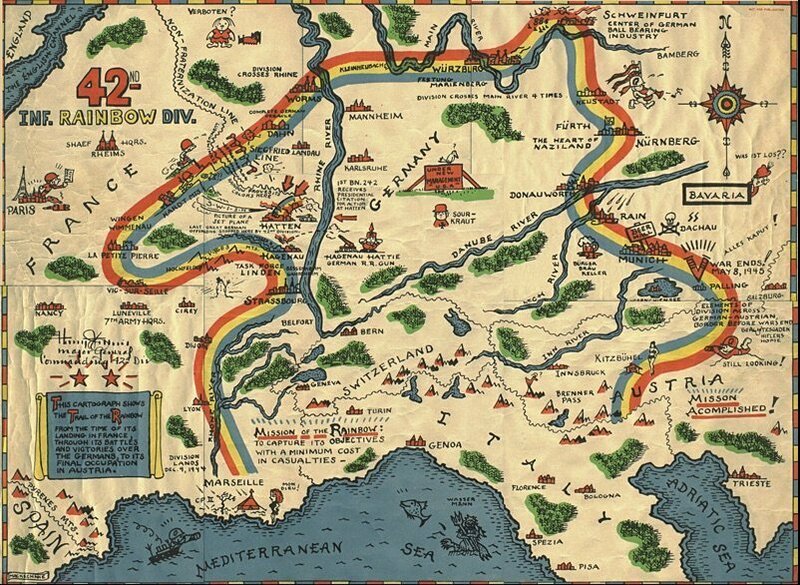 Photo credit: 42nd "Rainbow" Infantry Division : A Combat history of World War II, Lt. Hugh C. Daly, editor, 1946. Dachau was the first concentration camp, originally established in March 1933 near Munich, Germany soon after Hitler rose to power. At first Dachau held only political opponents, but over time, more and more groups were imprisoned there. 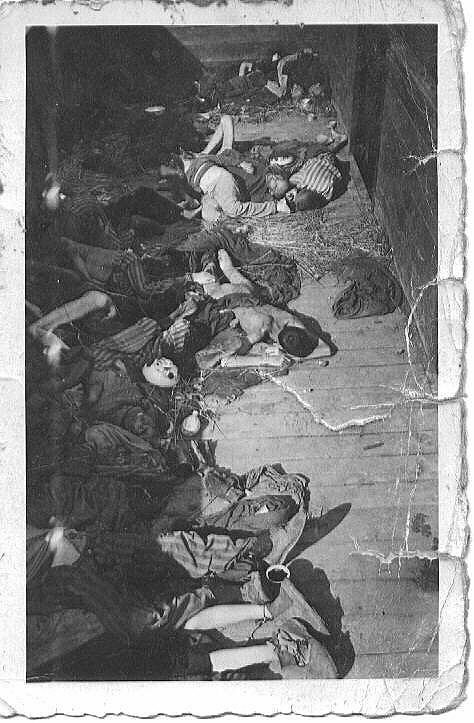 Thousands died at Dachau from starvation, maltreatment, and disease. 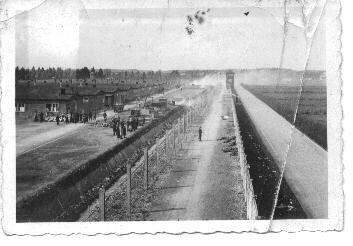 I have written a 4-part series of articles on the background of Dachau which you can find here. On April 29, 1945, the Allies fought their way and finally made it through the gate. 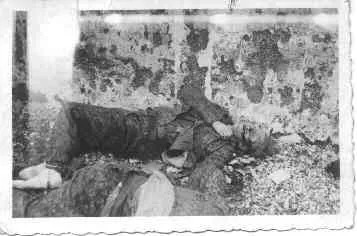 My father left me the following photos taken during the liberation. I still have these photos -- of those who survived, who looked like "living skeletons." 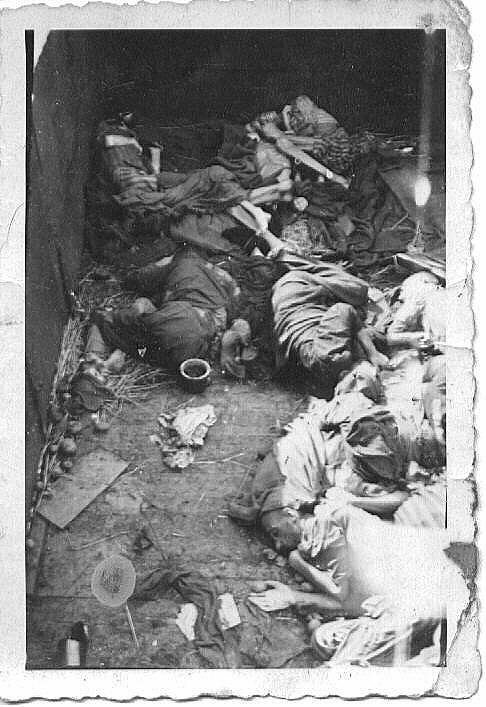 I also have the photos of the skeletons of those who did not survive -- of the open train boxcars with bodies piled high. Dachau sat along a train track. As it became clear to the camp guards that the Allied troops were approaching, the captors sent some of the prisoners by train to other camps. When those camps refused them, they were shuttled from camp to camp without food or water, ultimately ending up back at Dachau. Most died during the trip. My father had seen a lot of action up to this point in the war. But nothing he had seen so far prepared him for what he saw at Dachau. 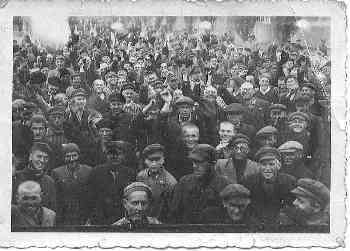 Buchenwald was the first camp liberated. When General Eisenhower visited there he vomited. Dachau was worse. There were over 40 train boxcars outside the camp with about 2,000 dead. My father said that he watched his commanders throw up when they saw what had happened at the camp. "My lieutenant lost it" he told me. "The smell of death was overwhelming." In some cases, the prisoners killed their former captors. Some of the Nazi guards tried to escape. In other cases, U.S. machine gun fire killed some 30 guards, although General Eisenhower later reported, "Our forces liberated and mopped up the infamous concentration camp at Dachau. 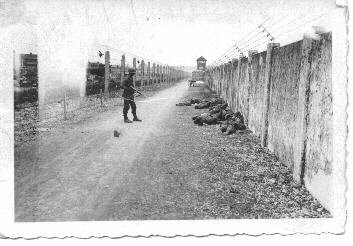 Approximately 32,000 prisoners were liberated; 300 SS camp guards were quickly neutralized." Initially, the prisoners thought they were dreaming. "They could not believe it was true that after so long, they were finally being liberated." The liberated looked like the dead. "They were skeletons," he told me. It was only later that fear gave way to joy. The next day, on April 30, 1945, with his squad being one of the first into nearby Munich, my father captured the Nazi general in charge of all the German anti-aircraft artillery outside of Munich. The general's lieutenant came out and told my father "My general will surrender only to someone of equal or greater rank." 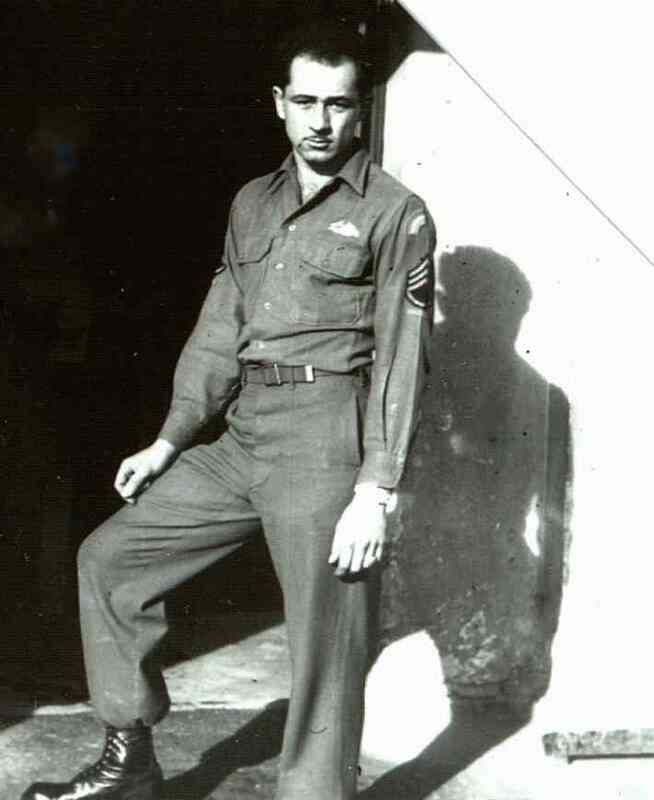 My father, was only a lowly staff sergeant, but he wore no stripes, which was not uncommon for Non-Commissioned Officers, "otherwise they'd be the first ones shot by the enemy." So John Petro, all of 23 years old said, "OK then, bring him out!" The general surrendered to my father his pistol. "Stars and Stripes" the official U.S. military magazine later recounted the story, with a picture of the general and his daughter, with her hair shorn short. The general believed the propaganda that if his daughter were captured by the Allies, she'd be mistreated. The magazine could not attribute the capture to a lowly sergeant, when the story was published it was credited to a higher ranking US officer. The last time I saw my father before he died in 1975, he told me the story. 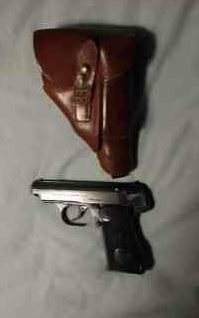 And now I have the general's surrendered pistol, a Sauer and Sohn 7.65 mm side arm. At the end of WWII, U.S. troops found camps of Displaced Persons, whom the Nazi's had used for forced labor. There was also the question of what to do with the captured German soldiers and service people. John Petro was in charge of three P.O.W. camps. From one he brought home a carved nameplate. It was done for him for a Bavarian clockmaker, he told me, "for some extra food." Another one of the camps was a women's camp. He told me it was filled with "the Mata Hari type"... but explained no further. My brother recalls that my father told him it was populated by mistresses of the German officers. 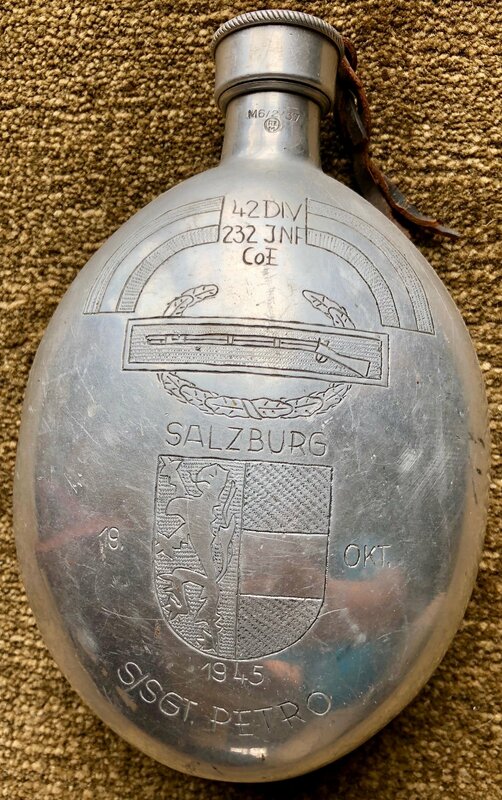 Following the war, my father was in Salzburg where he had made a commemorative inscribed metal canteen. On the front was "42 Div, 232 Inf, CoE" between two Rainbow arcs. Below that, the Infantry sharpshooter emblem and the word Salzburg with the Austrian crest, surrounded by "19 OKT 1945" and "S/Sgt Petro" below. 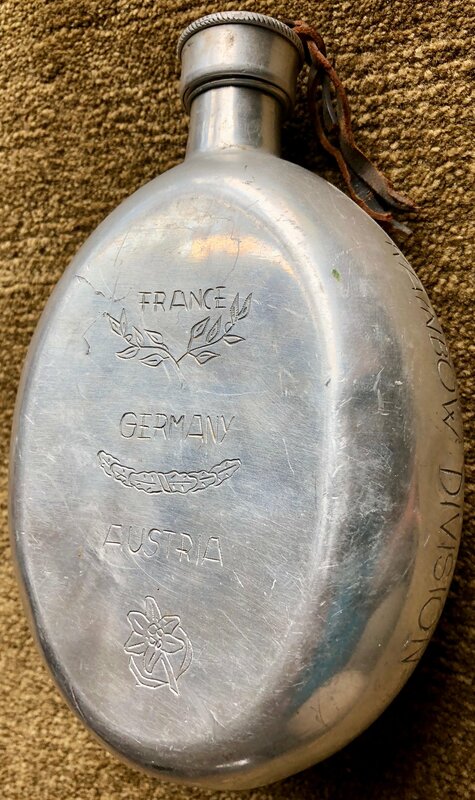 On the back was "France, Germany, Austria". The Hallmark was "RZM" inside a circle, with the numbers "M6/2/37". Ironically, my first visit to Salzburg was in October of 1995... almost exactly 50 years later. 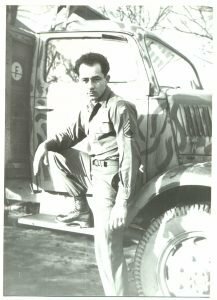 After the war was over, Army leadership was distributing battlefield commissions, or what my father called "foxhole promotions." My father refused, knowing that these officers would have to remain following the war. Indeed, the "Rainbow" Division would remain in Austria for 10 years until 1955 as an occupation force. My father didn't want that. He told me, "I'd had enough, I wanted to go home." HBO's "Band of Brothers" site. "Tell us who were there that it never happened" remarks by Felix L. Sparks on May 8, 1995, at the U.S. Holocaust Museum.